As of writing this, the 2017 NCAA Wrestling Championships has just ended so wrestling is top of mind for me right now. Wrestling relates really well to sales, & can give great insight into how to improve your sales process. Last year I started working with Wrestling Mindset helping them & individual wrestlers reach their full potential. One of the areas where Wrestling Mindset is helpful is getting wrestlers to open up & take more shots. They have looked closely at this situation & figured out the main reasons why wrestlers freeze up. Turns out, it’s not that different from the reasons that salespeople hold back. Many wrestlers will not take risks because of fear of failure/losing, similarly a salesperson will not ask the prospect for the business or ask the tough question because they worry it might blow up in their face. Wrestlers worry that they will be in a close match & won’t have any opportunities to come back if they make a mistake. This believe in scarcity of opportunities also runs rampant in the sales industry. Physical & Mental Fatigue: Often times wrestlers develop paralysis by analysis along with salespeople & they never open up. They tire themselves out both physically & mentally worrying about the worst case scenario. Long before they step out onto the mat or sales call. When they tire mentally & physically they fall into old habits. They choke under the big lights because it is a big tournament, they blow up the sale because it is a big client. Give the competition too much respect & focus on them. They are too tense & not having fun. 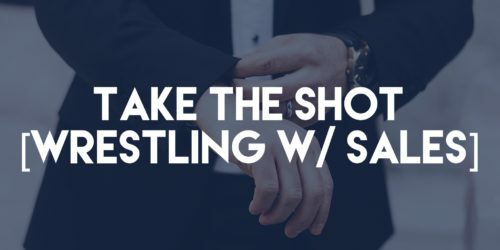 They know it will likely take multiple shots to get the job done, a sales rep/wrestler might have to take over 3 shots on the same person just to get an opening. How often to wrestlers/salespeople back off after a first attempt is stuffed? They focus on what they do well, they don’t focus on the competition or get caught up in hype or rankings. They trust in their training & use that as a confidence builder, if you have done the right amount of preparation & self development there is no reason why you should worry about being successful. They treat all competition/clients the same. It doesn’t matter if you are wrestling in the national championship or going after that whale of an account the preparation & the rules of engagement are the same. They know how to forgive themselves for a loss & don’t overburden themselves on attempts that didn’t work out. Is your sales team still beating themselves up over a bad quarter? Are you as a manager dwelling on the one sale your rep lost? They know how to clear their head & pull the trigger when the moment is their, they did the right amount of mental/physical training so they have the energy to take the shot late in third period, or deliver value after meeting with several other clients. Are you blowing sales because your last sales call of the day is nothing like your first sales call? Are you not able to sleep the night before because you are worried about where your next sale is going to come from? They know another opportunity is there. If a sales rep does the requisite amount of prospecting they are not afraid to challenge a customer & lose them if it means the sale is no longer in limbo. Likewise the best wrestlers know even if they give up a takedown or a point there are plenty of opportunities for them to score. They don’t worry about making mistakes, they don’t worry about losing the sale, they trust in their abilities, their coaching & always see opportunities to grow in the sport of wrestling/business. Also, if you have a team or athlete who doesn’t pull the trigger, chokes in big matches, or can’t be loose & have fun go to www.wrestlingmindset.com & sign up for a free trial session.